Read the many ways Russell & Lazarus have successfully resolved their clients’ accident claims. While these results are never guaranteed for other cases, these slip and fall cases results will show you the importance of hiring an experienced law firm that handles only personal injury claims. If you have been injured in a slip and fall accident, it will likely be in your best interest to contact an Orange County slip and fall attorney. A slip and fall accident generally means that you fell and injured yourself on someone else’s property due to the fault of the property owner. If you would like an idea of how your specific slip, trip and fall injury claim could end up with a positive result, contact the Orange County Slip and Fall Lawyers at Russell & Lazarus today at (800) 268-9228 for a complimentary case evaluation. A 72-year-old grandmother, who fractured her left femur, was forced to go to trial by Allstate Insurance Company after being struck by a scooter while exiting the restroom of her church. A 49-year-old computer specialist sustained multiple fractures to his arms when he tripped and fell over a nearly invisible guide wire negligently installed by the defendants’ employees who were instructed in English but only understood Spanish. A 44-year-old construction worker injured his back requiring surgery when his foot went through the flooring of his apartment complex walkway after a poor repair by management. Slip, trip and falls often result in injury to the back, neck, or a limb, such as when the victim tries to break his fall by extending an arm. 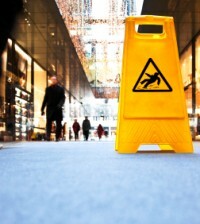 One complicating factor in slip and fall accidents is that often the injuries are to the soft tissues, which are not generally measurable with traditional equipment like X-rays. The insurance company may argue that the victim’s injuries were not as great as claimed, or even that he was not truly injured at all. To win a slip and fall case, you will generally have to show that the property owner was negligent or careless in maintaining the property. Property owners have the legal duty to keep their premises reasonably safe for visitors and others lawfully on the property. A Orange County accident attorney can explain to you that if a property owner fails to take certain basic steps, the owner may be responsible for any injuries that occur on the property. You may want to work with an experienced counsel as you will be pitted against hostile insurance companies and uncooperative property owners. 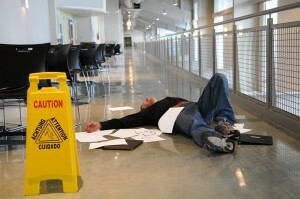 An Orange County Slip and Fall Lawyer will advocate for your rights while negotiating the best deal for you. Medical Costs. These can include costs of medicine, physical therapy, hospital bills, and others. Lost Wages. If injuries prevent you from working, you may be entitled to lost wages. Pain and Suffering. Your Orange County accident attorney may explain to you that you be entitled to monetary damages for non-economic injuries related to pain and suffering. If you would like an idea of how your specific California injury claim could end up with a positive result, contact an Orange County Slip and Fall Lawyer at Russell & Lazarus today at (800) 268-9228 for a complimentary case evaluation.